Take the road east from the Poqueira Gorge and in 10 minutes you come to the Tahá de Pitres. Presided over by its small “capital” of Pitres, the other six hamlets of the Tahá are some of the quietest and prettiest places in the High Alpujarra. Three of the hamlets are at the end of country lanes that go no further: you park and start walking. Unlike the Poqueira Gorge which runs north to south from the mountains, the Tahá runs east to west. The terrain is softer, the hours of sun are longer, and atmosphere is even more relaxed. -Visit the church and arts centre in Pitres. The arts centre on the left as you enter the village has paintings, leather and pottery by local artists and craftspeople that you can view and buy. -Friday is market day in Pitres. It’s a social occasion, too, with people taking the opportunity to catch up and have a drink afterwards at one of the terraces on the main square. -Go swimming at Pitres campsite. The large open air pool is open during the summer to non-campers paying an entrance fee. There are lawns and trees around it and there’s a restaurant. 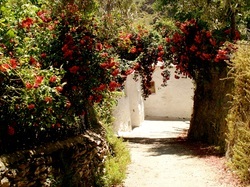 The campsite is on the left just before you get to Pitres (15 mins from Capileira). -Learn pottery or painting from professional artist and teacher, Sheilagh Mulry, at her beautiful workshops in Fondales. Ask us for contact details. 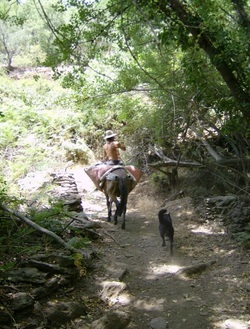 -Hire the services of the Alpujarra’s most widely experienced and genial walking guide: George Robinson. Ask us and we'll put you in direct contact with him. Follow the road east to go further and deeper into Las Alpujarras. -Visit Trevélez, the highest village in Spain (1,476 m). Try mountain-cured ham or trout from the local river. A lot of tour buses stop here so beware of large, impersonal restaurants. Best meals, atmosphere and views at La Fragua, on the highest of the village’s three levels. As you come to Trevelez, turn off left and follow the sign for Barrio Alto. Drive straight on to a parking area and La Fragua is just up by the church. -From Trevélez there are great walks up to the Seven Lagoons or Mulhacén. The road round the mountains leaves Granada province amd continues into the Alpujarra that belongs to Almeria. -On the way to Trevélez is Bar Paco in Busquístar.